Wherever you look, the topic of Israel is a contentious issue. Most people, all over the world, consider Israel to be a threat to global security and would probably like the state of Israel to vanish. Christadelphians do not hold any political views on this subject and are not engaged in or supporting any manmade political movements, however what we observe in the world around us and what we see in the plain teaching of the Bible is consistent, proving that God is in control of the kingdoms of men. 3. A witness that Jesus Christ is going to return to the earth. As we go through this subject we hope you will see that the above three statements are true. So the message of Genesis 12 is very important to any Bible believer. Old and New Testament come together in a clear and distinct way. God made of Abraham a great nation and the purpose of this was so that eventually the whole world would be blessed. The benefit that is being offered to the whole world is the forgiveness of sin, through the descendant of Abraham, the promised seed, Jesus Christ (Galatians 3:22 & John 1:29). Although the Jewish nation did not accept the Messiah, Jesus Christ, they are still God’s people and they have a huge part to play in God’s future plan and purpose. So then, Israel have been chosen by God. 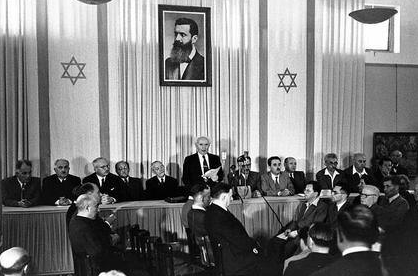 Why have Israel had such a turbulent History? Jesus prophesied of the destruction of Jerusalem by Rome in AD70, now a fact of history. But he also stated that Jerusalem would be trodden down until “the times of the Gentiles be fulfilled”. So eventually Jerusalem was not to be trodden down by Gentiles (non Jews). The identity therefore of the “one whose right it is”, the “seed” who would reign forever over the re-established Kingdom of Israel, is Jesus Christ. The one who will return to save them in the final conflict. The Bible teaches that the nation of Israel has a great part to play in the future Kingdom of God on the earth. It is linked to the gospel message itself and we would urge you to continue to study the Bible’s teachings on this topic. It’s amazing that the Bible teaches that there would be a partial restoration of Israel in unbelief of their God – this return would be the catalyst of the final conflict between the nations and Israel. It teaches that in the midst of this conflict Jesus Christ will return to rescue God’s people Israel. In the book of Zechariah we have an amazing prophecy of the conflict between Israel and the nations. We read that Jerusalem will eventually become “a burdensome stone for all people: all that burden themselves with it shall be cut in pieces, though all the people of the earth be gathered together against it.” This is describing a future conflict. The details are very interesting to the Bible student. The term “Judah” in the Bible is a description of the Jews in the land of Israel. So at the point in time when the nations are all against Israel, the prophets tell us that there will be Jews in the land. We also learn here that those Jews will be saved first. In other words, the Jews in the land will be saved by God before the other Jews scattered around the globe. The reference to the Jews of Jerusalem looking upon one who they pierced is clearly a prophecy of the Jews coming face to face with their Messiah. The Messiah who, as God’s representative, will have returned to the earth to destroy the nations who have come against Jerusalem. The Messiah who is the risen Lord Jesus Christ. This is the time of Israel’s conversion, when they, as a nation realize that they did indeed crucify God’s only begotten son. They will mourn. An amazing prophecy. For it to happen however there has to be Jews in the land. Jews who do not at this time accept Messiah as being Jesus. Jews who will be attacked by the nations around. In our day we have seen that regathering of Jews.